I am slowly catching up on projects! 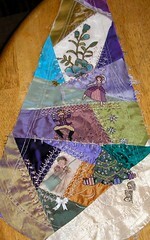 This is the second wedge that I stitched up for Kerry at CQI for a Christmas rr we were in together. This is a first for me in using waste canvas on crazy quilting, but it brought a wonderful element from the Nutcracker Suite into it! I did the sugar plum, a nutcracker and christmas tree. Gladddd its done tho! LOL!! 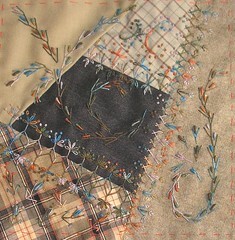 I kept all the seam treatments monotone and quiet as I wanted the focus to be on the cross stitched motifs. Hope you like it Kerry! I have finished up some angel stitching work on this block of Simona's at CQI. I created a walkway lined with flowers, some grass, a field of lavendar, flowers on the pergola and a little water fountain. Cobi had already done a tremendous amount of gorgeous work on this, I had only to finish. I hope you will enjoy this block Simona! At CQI (Crazy Quilting International) I am in a wool block round robin. This block is Hideko's in Japan! Isn't it lovely!!! 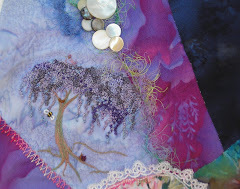 I enjoyed stitching on this block sooo much! Hideko asked for seam treatments and maybe a small motif, so, I broke the rules and did seamy motifs! LOL!! The thread is Caron Wildflowers thread which was just wonderful to work with and the colors of this varigation seemed to accent the block just perfectly! Lynn Schoefflor is a wonderful friend and one of the brightest of her class in cq! 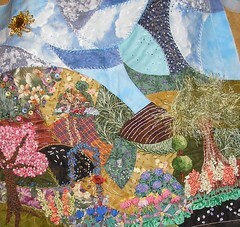 She had asked to borrow several of my pieces for the San Jose Quilt & Textile Museum lecture last month. I was very honored for me and work to be exhibited with Sharon Bogon, Jo Newsham, Rengin Yazitas, Alison Aller, Pat Winter, Hideko Ishida, Maureen Greenson and other talented CQers!! 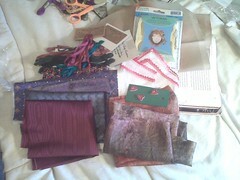 This is a picture of the goodies that Lynn sent when she returned my quilt, purse and blocks. Soooo very sweet of her. I greatly cherish our friendship and admire Lynn for her generosity, knowledge and creativity. Thank you Lynn! My friend, Debbie is having a give away to celebrate her brandy new blog! I have added my name to the running, but will add a twist! IF I should win, I would like the goodies to go to someone new to cq with limited stash! I have someone in mind, but would like to hear from anyone else that is just starting out and I will draw a name! Sewwww, keep your fingers crossed that I win! LOL!! !